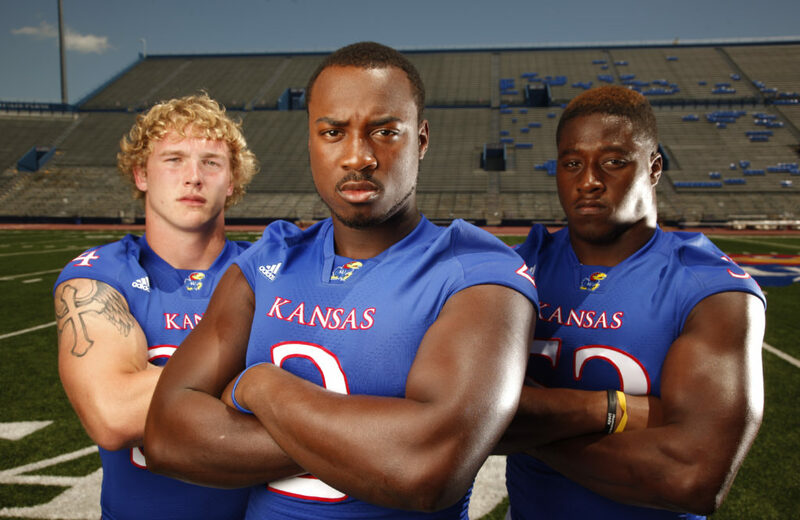 KU linebackers Huldon Tharp, left, Darius Willis and Steven Johnson. It didn’t raise so much as an eyebrow when Darius Willis reported to Kansas University’s preseason football drills sporting a new number. 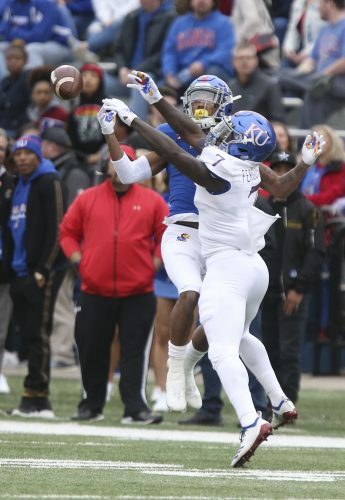 Willis, KU’s third-year sophomore inside linebacker from Houston by way of Buffalo University, explained the new digit was his old high school number. Fair enough. So his old No. 39 was gone, replaced by No. 2. It so happens, though, No. 2 was in use, by sophomore incumbent quarterback Jordan Webb. Again, no problem. Willis appealed to a higher power — coach Turner Gill — who said the two could share the 2. They play on opposite sides and look nothing alike. Aside from differing races, at 6-foot-3, 243 pounds, Willis has three inches and 30-plus pounds on Webb. As it turns out, Willis sported No. 2 at Houston Eisenhower High as a linebacker/quarterback. One of the reasons he headed off to distant Buffalo — where he was heralded as one of the highest-ranked recruits ever lured to the New York tundra — was that the head coach at the time, a fella by the name of Turner Gill, convinced Willis he’d be considered as a QB. Other schools projected him purely as a linebacker. So here we have a former quarterback suddenly wearing the number of the current quarterback, playing for the coach who told him he’d have a shot at quarterback … does Willis, perhaps, want more than Webb’s number? Might he want his job, too? He means that in more ways than one. 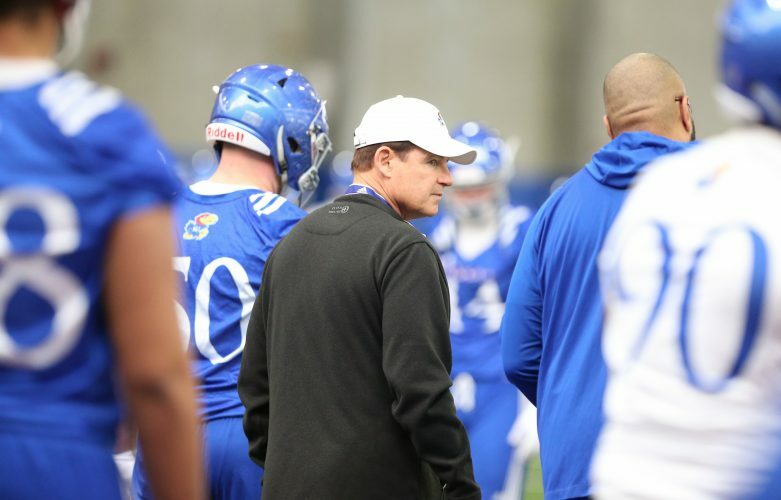 Content not to line up under center but a couple of rows opposite it, Willis also is tickled to have landed at KU, where he was reunited with Gill. A decorated and sought-after recruit at Eisenhower, Willis was a nonqualifier in 2008, but eventually gained the necessary SAT score and landed in Buffalo in January, 2009. That fall, he cracked the starting lineup at middle linebacker and had 10 tackles, 21?2 for losses, in two starts before suffering a ruptured pectoral muscle that forced him to miss the rest of the season. 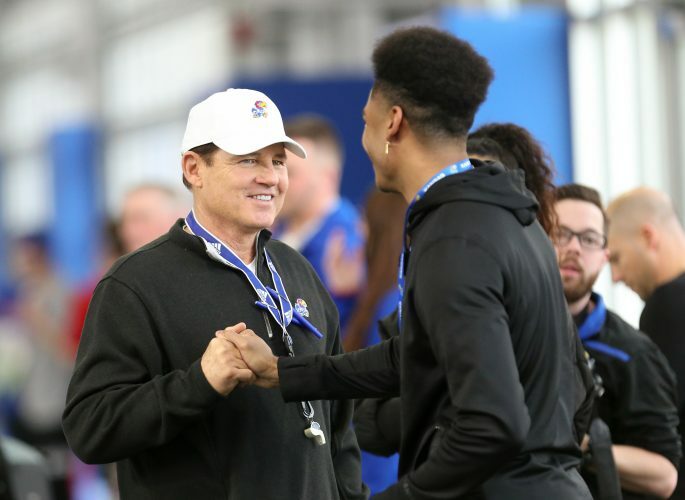 Gill left for KU after that season, and Willis went through spring drills before deciding to leave, too. After a short recruitment, he landed at Kansas and sat out a season, during which he was named the Compete Team defensive player of the year. 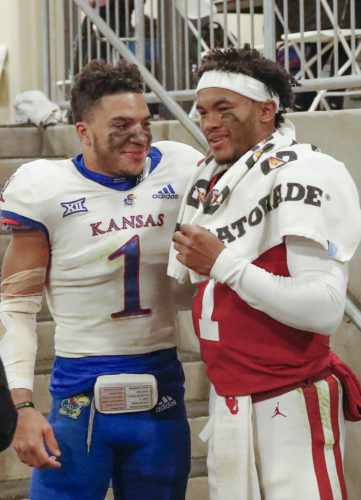 So here you have a guy who was wooed by many of the schools of the Big 12 as a high schooler, who seemed destined for stardom at Buffalo before ending up at KU where, after a year of learning and working out, he has done nothing but add to his outside expectations. “A lot of people when they see a player that’s my height and my weight and my stature,” Willis said, “with the ability I have to run around and make plays … a lot of people put hype on that type of person because they think he has the ability to accomplish all the things he wants. As frustrating as last season was, Willis reckons it did nothing but make him better. It’s no secret Kansas has emphasized speed in recruiting, and in that regard Willis is a poster child.